Pathrade or pathrado is a popular GSB dish prepared with Colocasia leaves.There are different varieties of leaves.The different varieties and names are arvi leaves,taro leaves,tere paan,pathrade paan,Madras leaf,Maralva paan which is one more variety which is found only during the Monsoon season.I used Tere paan(Taro leaves) for this batch which we brought from our factory site and are the best leaves in the world since it doesn’t itch.Pathrado is prepared during religious functions like Nagarpanchami,Ganesh chaturti,gauri pooja etc. I wanted to post pathrado recipe long back,but without the stepwise pictures it doesn’t make a complete post,so I was waiting for the right time.My Amma helped me in the whole procedure while I tried my best to capture pictures.She was slightly uncomfortable as she is used to do her job superfast and she had to pause for the pictures every now and then.Nevertheless she tried her best.I have also captured the video which I will post once it is ready….Thanks a lot Amma. Most of the times pathrade slightly itches so few dislike,but if the leaves are good,not to worry.Amma says if we add bimbul or Ambado it itches less and pathrade becomes soft.We also prepare seasoned version of pathrade.We make the best use of leftover pathrade’s by preparing upkari,tawa roast,pathrade ghashi etc…I follow my Amma’s recipe and since we like soft version we prepare it with moong. In Coastal Karnataka people have their own versions of Pathrade.Brahmins prepare it slightly sweetish and relish it as breakfast.I like Maharashtrian version of Aaloo vadi too.My Aayi(Granny)says the leaves should slightly fade as it is easy to smear the masala easily than the fresh,crisp,rain drenched leaf.My leaves slightly turned yellow as I prepared pathrade after 3-4 days so I could not capture fresh pictures of the leaves. Coming up next Panha pathrado(seasoned version) and chitte panha phodi(fried version).Until then stay tuned. Wash the colocasia leaves thoroughly and wipe it well. Turn it to the opposite side and carefully remove the thin centre veins slightly. See that you don’t tear the leaves. Soak moong and rice together for 3-4 hours. Wash it well,drain it thoroughly and grind it along with roasted chillies,coconut, tamarind,hing and salt to a fine paste. You may also add jaggery to taste, to the masala. What I did was I added jaggery to the little batter separately for approx 2 rolls and then steamed. In a clean kitchen platform place a big leaf with the back surface facing towards us. 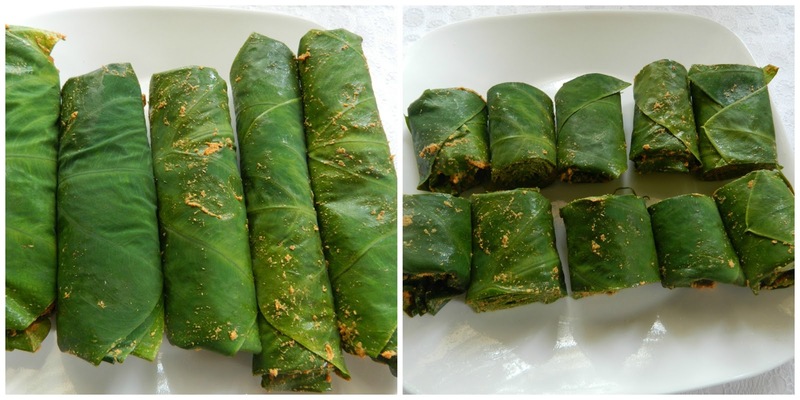 Smear the masala with the help of your hands all over the leaf evenly. Place a smaller leaf to the left first and smear the masala evenly. Then place one more leaf to the right and smear the masala evenly. Again place one more leaf to the centre if the leaf is small and smear the masala well. Repeat the smearing process with 5-6 leaves depending on how beg roll you want. You may refer the pictures to get the idea. Once the leaves are placed one above the other,fold both the side edges first about 2″ then again smear some masala to the edges. Now start folding from the bottom that is from the stalk part,smear little paste to the first fold only and then keep rolling it till the end. Now again smear the paste to the final edge on the tip of the leaf to seal it well. Rolling procedure is same like spring roll or swiss roll. Fill the steamer with water,arrange the pathrade’s on the steamer plate and steam it for 30-35 minutes. Serve it hot topped with coconut oil. The leaves which I used were medium sized so I placed left,right and centre procedure. If the leaves are big you may place it in the centre and balance the roll well. See that the layers are fine. Usually we prepare it in a vessel called ‘Pedavan’ which is exclusively used to steam idli,khotto,pathrado etc.